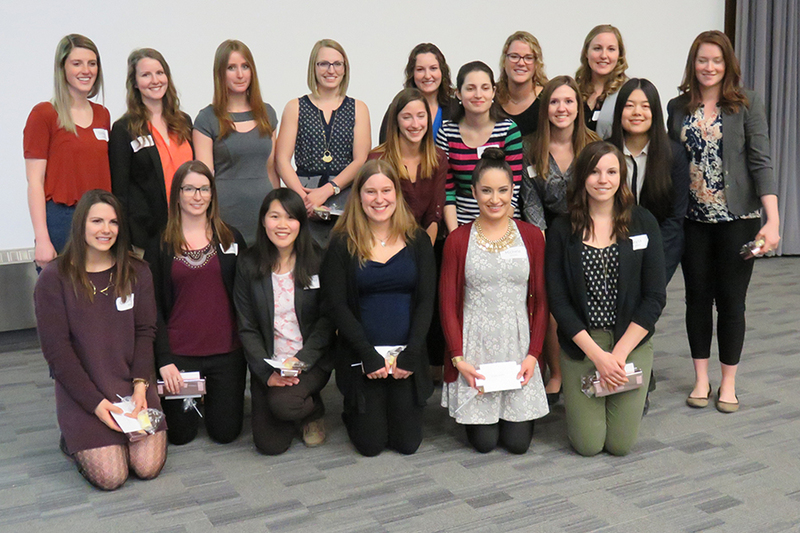 The annual Dietitians of Canada Saskatchewan Research Day was held on Thursday, April 21, in the Health Sciences Building at the University of Saskatchewan (U of S). The day highlighted and celebrated the fourth year nutrition students' practice-based research project presentations, and featured presentations by leading experts in food and nutrition. Keynote speaker Patricia Chuey (BScNutri, 1989; MSc, 1994), RD, FDC discussed how to market and brand yourself as a Registered Dietitian and entrepreneur. In her presentation “Building your ‘brand’ as a dietitian” she spoke about her own experiences and challenges throughout her career, and offered advice for the soon to be graduates. A professional presentation by Allison Cammer (BScNutri, 1997; BA, 2003; MSc, 2007), RD focussed on nutrition and dementia. Her presentation “Nutrition and dementia: What do RDs need to know?” included background on her work at the Rural and Remote Memory Clinic. Congratulations to the Nutrition Class of 2016 on completing their internships!